An American photographer just loves the Son Doong Cave. He has taken photographs of the caves for some of the smartest magazines in the world. Some of his photographs are really special because they were taken with the help of a little aircraft that flew around the cave without a pilot, to get better views. These aircraft are called drones. Caves in the central province of Quang Binh have wowed the world with their stunning natural beauty and have stolen the hearts of many people, including Ryan Deboodth from Nebraska, the US. Originally a software engineer, Deboodth has become famous worldwide thanks to his photos capturing the magnificent caves, which have appeared in many prestigious magazines like National Geographic, National Geographic Traveller, Smithsonian, Guardian and The Telegraph. Deboodth was surprised by this turning point in his life, because he had never taken photos of caves or even entered one four years ago. "I was drawn to cave photography because I love shooting things that have never been photographed before. I love adventure and exploring the unknown, and caves are one of the last frontiers of exploration," Deboodth said. "I started in high school with a photography class. It wasn't until I started shooting caves that I pursued it as a profession." The beauty of Son Doong Cave has hooked the 32-year-old engineer, and he has returned to shoot the biggest cave in the world on several occasions. Deboodth first trekked to the cave during his honeymoon in Viet Nam, when a friend invited him to take photos inside the caves in Quang Binh. 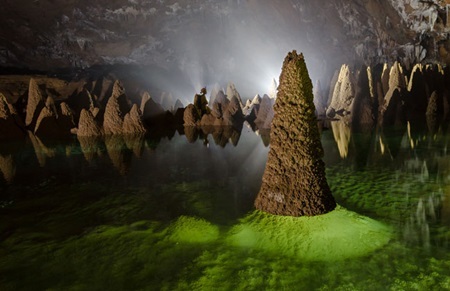 He entered Son Doong after images of the world's largest cave had been featured in many prestigious magazines, so he decided to consult cave expert and explorer Howard Limbert, a member of the British Cave Research Association, about the angles he should shoot from to capture different images from those already published. On his third visit, he decided to film the cave with a DJI Phantom 2 drone and a GoPro Hero 4 Black camera, aiming to capture its fairy beauty and introduce it to the world. Although Deboodth was the third photographer to film the cave using a drone, his video is widely regarded as the best and had received most views, according to Limbert. Deboodth's video, which captures the beautiful moment of sunlight beaming into the cave through a skylight, was aired during Good Morning America on ABC last May. Deboodth said that such a rare moment, which lasts for only an hour from 11 to noon, was one of the most wonderful moments he had filmed inside Son Doong Cave, and the most beautiful moment in his entire life. A photoshoot takes him at least a week to prepare for. "I have to prepare all my gear and make sure everything is working correctly. Once in the cave it is a group effort to create the photos. I need people holding lights and people in the photos." Furthermore, a single image can take up to an hour and might cost hundreds of dollars, depending on how many flashbulbs he uses. As a cave photographer, Deboodth's favourite accessory is his lighting equipment, "as without it my photos wouldn't be possible", he said. The equipment he has to prepare before each shoot includes flashes, powerful flashbulbs and LED lights. Besides his careful preparations, Deboodth's amazing photos are the result of his teams' efforts to overcome many challenges. "Access is of course limited as the caves are in a National Park and they must be conserved. "To get to some of the caves can involve hours or days of trekking through the hot and humid jungle carrying heavy gear. Once in the cave, one of the bigger challenges is getting enough light in the cave as most of the caves in Quang Binh are relatively large." One of the moments he remembers most is when he flew his drone out of the second skylight, known as the doline, in Son Doong Cave. Deboodth regards it as one of the scariest things he has done photographically in Son Doong. "It is over 300m high from inside the cave to reach the top of the doline and as I just went about the doline I lost video feed. I couldn't see the drone anymore so I didn't know where it was. Fortunately the video feed came back eventually and I was able to bring it back down. It was a very nerve wracking and memorable experience," he recalled. Deboodth has visited Son Doong Cave five times and spent 30 days inside it. A software engineer is someone who works with computer software. Prestigious means well-known and highly respected. "I love adventure and exploring the unknown, and caves are one of the last frontiers of exploration," Deboodth said. The last frontiers of exploration are places that have not yet been explored. "It wasn't until I started shooting caves that I pursued it as a profession." To pursue photography as a profession means to take it up as a way of making a living. To consult someone means to ask them for information and advice. A drone is a small remote-controlled aircraft. A rare moment is one in which an experience happens that does not happen very often. "I have to prepare all my gear and make sure everything is working correctly. Once in the cave it is a group effort to create the photos." Gear, in this case, means equipment. As a cave photographer, Deboodth's favourite accessory is his lighting equipment, "as without it my photos wouldn't be possible", he said. An accessory is an extra piece of equipment that is used for something special. The equipment he has to prepare before each shoot includes flashes, powerful flashbulbs and LED lights. LED stands for light emitting diode. Such light bulbs are more environmentally-friendly than others. Access to the caves means being able to enter the caves. If access is limited, it can mean either that not many people are allowed in, or it can mean that people cannot go everywhere in the caves but only to certain areas of the caves. Conserved means kept as they are so that they are there in the future. "To get to some of the caves can involve hours or days of trekking through the hot and humid jungle carrying heavy gear. When the weather is humid it is hot and sticky. There is a lot of moisture in the air. "Once in the cave, one of the bigger challenges is getting enough light in the cave as most of the caves in Quang Binh are relatively large." If the caves are relatively large, they are larger than certain other caves. Here, "regards it" means "sees it", or "believes it". "It was a very nerve wracking and memorable experience," he recalled. A nerve wracking experience is a scary experience. 1. The state in the United States where Ryan Deboodth comes from. 2. A prestigious magazine in the United States. 3. Something Ryan Deboodth takes a week to prepare for. 4. The country where Ryan Deboodth and his wife now live. 5. The country where cave expert and explorer Howard Limbert comes from. 1. Nebraska; 2. Guardian; 3. photoshoot; 4. China; 5. Britain.